1. More Calories: High-quality hay is the foundation of any healthy diet, and boosting calories through an increase of the hay ration is a healthier option than increasing the grain ration. 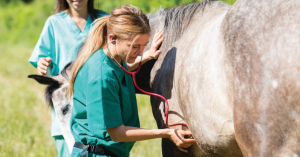 Horse owners should consult with a veterinarian about dietary management during the cold winter months. 2. Water, Not Ice: Owners should check several times daily to make sure the water source is not frozen. There are numerous types of heating units, made specifically for this purpose, to ensure that your horse has fresh, unfrozen water available at all times. 3. Fresh Air: Keeping your horse in a warm barn with the doors and windows shut is not necessarily a good thing. A well-ventilated barn, even if it means a drop of a few degrees in temperature, will keep the air fresher and healthier for your horse.Invest in a warm weatherproof blanket and leave a horse with airway disease turned out with access to a run-in shed for shelter. 4. Check Under Blankets: Make sure to bring the horse in and remove the blanket at least once weekly so that you can check for any new lumps, bumps, or changes in body condition. A good grooming session will provide the opportunity to check the horse thoroughly, and provide some valuable bonding time when the weather is not conducive to riding. 5. Blanket Consistently: Blanketing a horse will encourage less growth of the hair coat, so if you are going to blanket, be consistent. This entry was posted on Thursday, December 15th, 2016 at 4:05 pm	and is filed under News & Updates. You can follow any responses to this entry through the RSS 2.0 feed. Both comments and pings are currently closed.